An incident on the M6 near Junction 24 on Tuesday, November 14 2017. Photo by Alec Hurst. 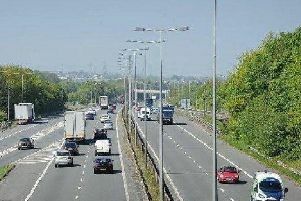 Fire crews and police were called out to a collision on the M6 near Lancaster. Lancashire Police said they received a call at around 11.55am on Tuesday November 14 to reports of a collision on the southbound carriageway close to Junction 34. A black BMW Z3 had been involved in a collision with a white DAF truck on a slip road and the hard shoulder. The driver of the BMW suffered a minor hand injury. Fire engines and crews from Lancaster and Carnforth said they ensured there were no remaining hazards in respect of fire, fuel, oil spillages or debris. The carriageway was closed for a time and the Highways Agency are currently dealing with congestion.